10th November, 2016 Bengaluru: The Akshaya Patra Foundation (TAPF) completes 16 years today. All along this 16-year journey, the Foundation has strived to address the issue of “classroom hunger” and promote “education” by providing nutritious meals to children in Government and Government-aided schools. 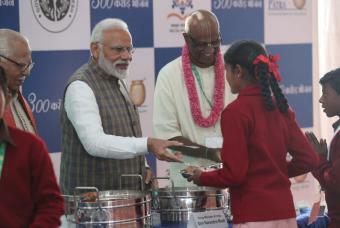 The journey began in 2000, with the feeding of 1,500 children in 5 schools in Bengaluru. Today, we reach 13,210 schools, feeding over 1.65 million children every day in 11 states through our 27 kitchens. Apart from school feeding, Akshaya Patra also feeds Anganwadi children, lactating mothers, and expecting women. The aim is to provide nutritious meals from the beginning of the child’s life and continue to nurture throughout the childhood, so that the child grows in the environment where social equality is for real and every child is provided a chance to learn and bloom. About The Akshaya Patra Foundation: The Akshaya Patra Foundation is a not-for-profit organisation headquartered in Bengaluru, India. The organisation strives to fight issues like hunger and malnutrition in India. By implementing the Mid-Day Meal Scheme (MDMS) in Government and Government-aided schools, Akshaya Patra doesn’t just aim to fight hunger but also to bring children to school.